Submitted by Rich Toscano on April 10, 2017 - 9:53am. Submitted by FormerSanDiegan on April 10, 2017 - 5:24pm. I see a new higher plateau in Toronto's future. Submitted by Escoguy on April 10, 2017 - 9:45pm. I was last in Toronto in 1990 and recall my Canadian friends telling me then how expensive it was. While cooler, the feel of the city reminded me much of Houston. At that time Montreal had a much more "in" scene with better nightlife. Fast forward, during our bubble, the Canadians prided themselves as having "sound banking" and "good lending practices". It may turn out in hindsight that deflating a smaller bubble earlier would have caused less problems. I get it that some of the money is from China/Vancouver and just looking for a place to go but at some point, it would seem locals would just say, Eh, i can move to Arizona and buy three houses. "Of course, I'd have to leave the great white north". But hey hoser! You can have your beer in Arizona and fly north for the summer. Eventually even the Chinese will figure out that Toronto is not SF or Vancouver or Hong Kong but just an over rated inland city which can sprawl out. Have fun in the meantime. Life's short! Submitted by ucodegen on April 24, 2017 - 5:08pm. Humm, I wonder where the exposure is - who is holding those notes? Submitted by spdrun on April 25, 2017 - 1:49pm. Submitted by Escoguy on April 26, 2017 - 9:25pm. Submitted by dumbrenter on April 28, 2017 - 8:26am. Is it because the rents increased at a faster rate in the US since '07? Submitted by RichardJamesEsquire on May 19, 2018 - 12:55pm. This subject crossed my mind today and I googled. Happens to be a year later and worth revisiting. This is the one I read. But it's all over the interweb. Might bring back more memories from over a decade ago now. 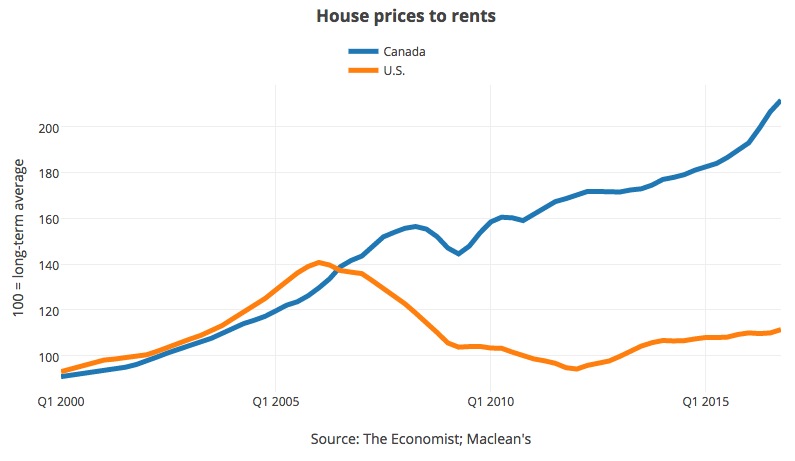 Whats this going to do to the economy, and jobs, in Toronto, and Canada, eh? Overall, beyond the short term, some reality must be good for both eh?